Our second night in Austin, we treated ourselves to a night's stay at the Hotel San Jose located in the very cool South Congress district. In our early afternoon walk through the area, we noticed Home Slice Pizza just a block from the hotel and giggled at the name of it's second location, for take-out only, right next door called More Home Slice. My cousin Valerie, who generously drove us down to and around Austin and joined us for the New Year's party, also gathered a few of her friends nearby for the night's dinner. 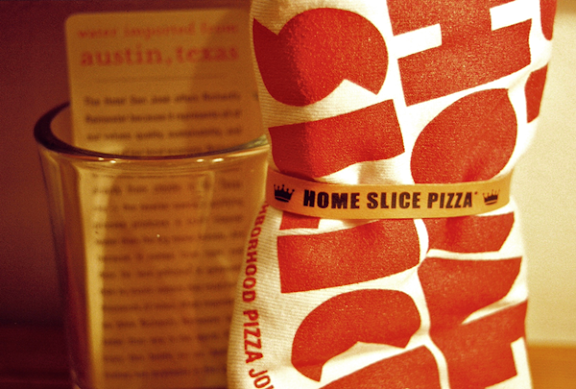 Conveniently, her friends by chance suggested Home Slice, their favorite pizza place in Austin and, as we learned later, a true Austin favorite. It was a quick 45-minute wait as we admired the back patio holding various levels of large group seating. The strung lights and vegetation created a great backyard party atmosphere. After being seated inside, I personally was entertained with the marketing phrases on the menu greeting us with "What's up Home Slice?" and "Congratulations! On your choice to enjoy Home Slice Pizza." Phrases that sound more like inside jokes were actually boldly displayed in printed form. They were notable examples of using the personality of the restaurant already evident in the overall mood to create its branding. 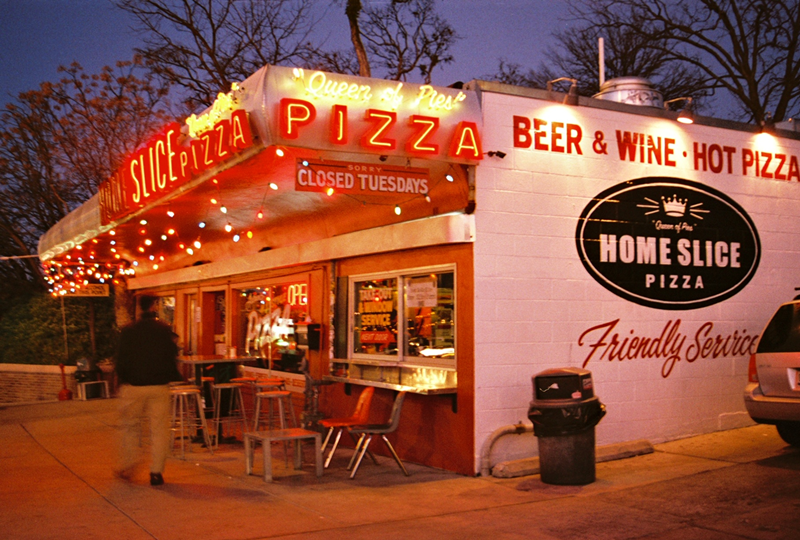 That was probably my favorite thing about Austin as I saw other businesses branded with genuine personality. For five of us, we ordered 2 large pizzas ~ the Margherita and the White Pie with Spinach. It was New York style thin crust pizza, no tomato sauce but topped with large clumps of cheese. The Margherita had delicious fresh tomatoes and basil. 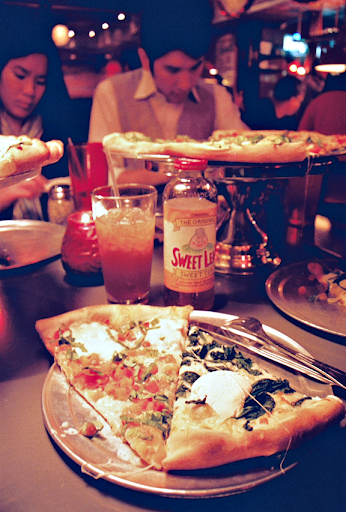 The white pie had 3 cheeses including my favorite addition ~ ricotta. As both were absent of any meat, we were able to appreciate the quality of these cheeses and pizza crust. 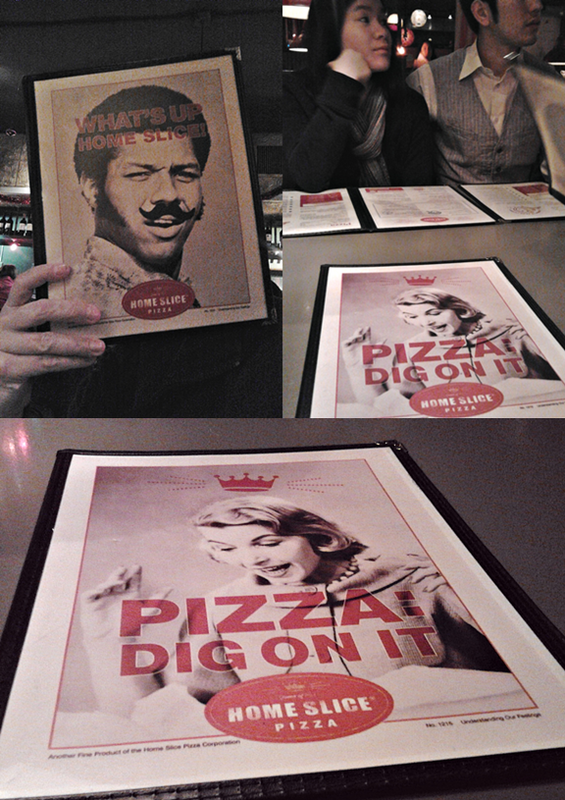 We also took a little slice of personality home with us. 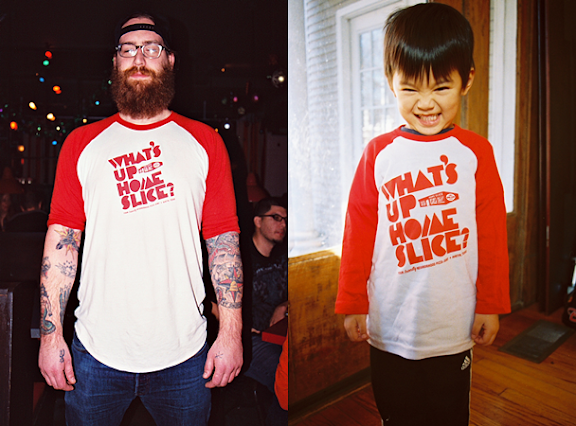 The "What's up Home Slice?" shirt that one of the managers Gabe wore that night was available for sale in all sizes including kid's sizes that we had to buy for Atticus. With their purely coincidental identical stance, it was like we shrunk Gabe and brought him home to Memphis. Stay tuned for Part 4 ~ Hotel San Jose. Film and camera phone photos by Sophorn. Special thanks to Valerie, Linh, Alexander, Matt, and of course Gabe. Useful information, Thanks for sharing. we are the best fast food restaurant in Delhi, Gurgaon, Noida and faridabad. A informative post. Nice share. Thanks for sharing. This is such a informative post. we are giving the best services of fast food services. This is a very useful article. Keep it up. thanks for sharing. Nice article. Give the wonderful information. Thanks for sharing. Thanks. Nice article. I am feeling very glad to see this post. Thnaks again. This is a very good description about the topic. I felt very excited. Really nice to read this was a good post. Thanks for sharing.This is quite good. Thank you for this information.May God always keep you happy. This is great post. Really had a great blog. Continue even further. This was a great post. Really a very important blog.